I was about to wrap the book up when I realised that we haven’t discussed the most obvious rest that we all need daily which is of course sleep. When a person is deprived of sleep, strange things begin to occur in their body. I heard of a man, whose girlfriend used lack of sleep as a manipulation tool. She kept him awake all hours over a period of a few weeks and by the end of this sleep deprivation, he had given her his entire life savings. It was as if he actually lost his mind. Once his friends intervened, she left him and his mental state returned to normal as soon as he had a good night’s sleep. His friends reported that during the weeks of sleep deprivation he began to act strangely and seemed quite depressed at times. Sleep restores energy to the body, particularly to the brain and nervous system. While we sleep all our bodily functions slow down significantly, including our heartbeat and breathing, this brings our body temperature down as well as our blood pressure. While all this slowing down is going on in the body during sleep, significant repair work and accelerated cell growth begins to take place. Sleep is the time when our body slows down in one area so it can speed up in another area, it slows down in using the bodies resources so it can speed up in rebuilding and repairing our body. It is truly fascinating what happens when we sleep which is why sleep is so important and why lack of sleep can damage both your physical and mental health. Sleeplessness has its most dramatic effect on the brain, which is why you can feel grumpy and moody from lack of sleep as well as unable to think clearly. Chronic sleep deprivation may lead to mental illness, obesity, heart disease and so much more. Most adults need around eight hours of sleep a night, some a little more and others a little less but eight hours is a good guideline. Studies have shown that people who get a good night’s sleep on a regular basis tend to live longer and healthier lives than those who sleep too few or too many hours each night. For many years I struggled with sleeping, at first I found it difficult to fall asleep and later in life I found myself unable to stay asleep, I would wake up all through the night and never sleep solidly. This struggle led me to research and experiment with sleep, which led me to the following keys that helped me have better quality sleep. Your bed must be for sleeping and relaxing only. In our home, we are very strict about our bedroom activities. Before this ‘rule’, we once had our office in our bedroom. Need I say any more! As you can imagine I would hop from my computer into bed and then would wonder why I struggled to fall asleep! It was like trying to sleep in an office, simply not the right environment at all. It was not long before my husband and I realised how harmful this setup was. Even though our bedroom was large enough to host our bed and an office area, we decided to move the office downstairs. We also removed all of my husband’s guitars and musical gear too as this was his job. Although music was a hobby, it was his profession too and so the guitars had to go. Lastly we removed all books that were work related so that all we were left with was bedroom furniture and a stunning, peaceful environment. My sleep greatly improved as a result of this simple change in environment. On particularly difficult nights when I cannot sleep, despite my lovely bedroom, I will listen to calm music to enhance the environment and many times even light candles to create more of a peaceful atmosphere. Having a separate place to work, eat, sleep, etc is essential to a good night’s sleep. With laptops becoming more and more common in our homes, it is tempting to sit in bed and work, surf the internet, catch up on Facebook or watch movies. However, in many cases the computer is a work item and should not be in your bedroom. Sadly, modern living and technology has really damaged our health in more ways than we will ever know. Be wise and listen to what your body is saying to you, learn to know when you need to sleep and what time you need to wake up. Each person is different and each person will have a personal preference when it comes to their sleep pattern. Who can sleep well when they are uncomfortable? We spend about one-third of our lives in bed. By the time we are 60, we will have slept for an average of 20 years. Contrary to popular belief, your mattress is the most important piece of furniture in your home, as no item in your home will get more hours of use. No other piece of furniture contributes so directly to your health and well-being. If your mattress is more than 10 years old, if it has formed annoying peaks, valleys or lumps, or if you wake up stiff and sore, it is probably time for a new one. The short of it is that your body needs a restful night’s sleep in order to be fresh for the day ahead. The effects of poor sleep can have negative effects on memory, cognitive skills, digestion and potentially many other functions. A mattress that is worn out or poorly suited to your needs can cause you to lose valuable sleep. To the contrary, sleeping on the right mattress can help you sleep better. Creating a quiet, cool and dark sleep-only environment in which to sleep in is very important. Firstly, quiet affects your comfort and lack of quiet can keep you tossing and turning all night. Some people use things with a constant noise to generate ‘white noise’, especially if they aren’t able to have total silence where they sleep. The white noise helps to mute the other noises that would cause them to wake up or not be able to fall asleep. A ticking clock can be quite relaxing for some. My daughter loves the sound of her fish tank filter, which she has raised slightly above the water level, so that that she can hear the trickling sound of the water, which soothes her. Of course, what works for one person can be an annoyance for another. One of my friends always takes the clock out of the bedroom when she visits us, she simply cannot sleep with the sound of a ticking clock. Some people benefit from setting their radio between stations to generate white noise that soothes them to sleep, but that would not work for me. Your room temperature will also affect your comfort and so will the position that you sleep in. An ideal temperature for sleeping is 18.33 °C and you should not have too many blankets as this can disrupt your sleep too. For optimal comfort, when sleeping on your side, use a pillow between your knees to help keep the spine aligned and if you sleep on your back, use a pillow under your knees to take pressure off your lower back. Finally, take care to wear comfortable nightclothes and sleep on a silk pillowcase. It has been proven that silk prevents aging! Studies have shown that amino acids can counter the effects of ageing, especially in the facial skin and can help calm the nervous system. Silk also contains natural cellular albumen, which helps speed up metabolism of skin cells – thus helping to reduce signs of ageing. Unlike cotton (which is an absorbent fibre and draws moisture), silk will not absorb natural moisture from your face and hair. Silk is a natural heat regulator, maintaining the correct body temperature. It does not conduct heat or static electricity like other fibers. Heat is retained during cold temperatures and redundant heat is shed during warm temperatures, keeping your skin cool in the summer and warm in the winter. 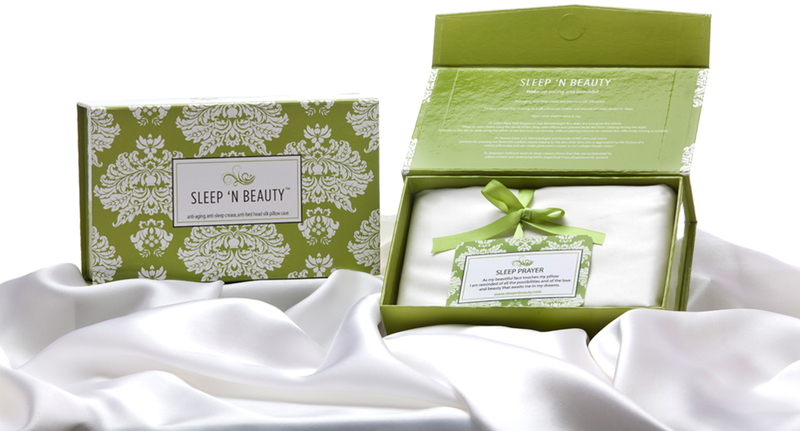 I found the information about silk, which I got from the Sleep ‘n Beauty website, fascinating so I contacted them to ask if they would send me a set of their silk pillowcases to try out. They were so lovely and sent me two of their beautiful silk pillowcases and I can honestly say that my skin and hair have never felt better. When I lay my head on my pillow at night I feel so comfortable and sleep very well as a result. I am quite certain that these lovely pillowcases will even reduce the amount of wrinkles that intend to pop up on my face in the future. I highly recommend investing in a set of silk pillowcases. This is a chapter snippet from He Restores My Soul. Find out more about sleep food, sleep exercise, sleep thoughts and sleep routine – some of the other things that affect our rest in He Restores My Soul.